I also have Patreon ( https://www.patreon.com/andrew_chuprina ) and Touch Arcade forum topic ( http://forums.toucharcade.com/showthread.php?t=306914 ). Today I've got a complaint: http://imageshack.com/a/img923/8996/1I2HqZ.png . Unfortunately, user didn't tell me how to contact CCP Pointy Bits, so here I am. My question is can I continue to make "o7 Capsuleer!" project? And if so, are there any restrictions monetizing the game? I mean, in-game purchases and advertisements. And one more question. 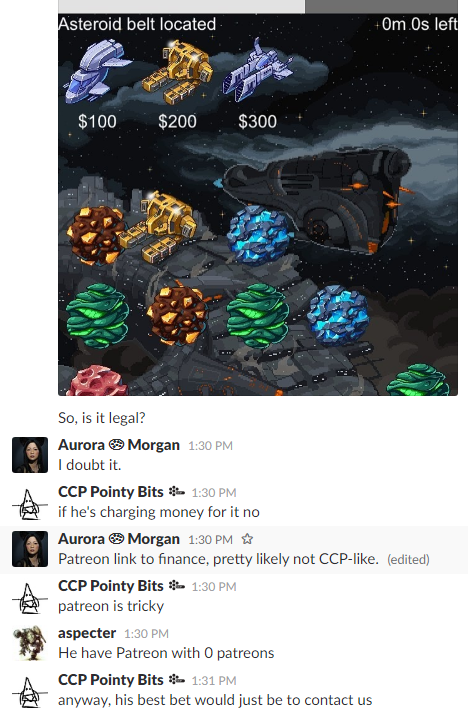 Game development costs money. I know, it's my problem, but now I lack approhimately 4000$ to publish a much better game in december. I plan to build game like Insaniquarium https://youtu.be/AoHBj6yKXhM , but about space. Expenses are game art (50%), programming (40%) and sound (10%). So can I lauch an Indiegogo campain for that? Is it legal? And if I have to remove EVE-like game art, what should I remove, talking about this screen: https://www.instagram.com/p/BXFU9HUhQTA ?